The Luire Cave, in the Vercors region of south-central France was the scene of a desperate, yet heroic fight between hospitalized French Resistance fighters and German soldiers battling the onslaught of the Allied Invasion in July 1944. 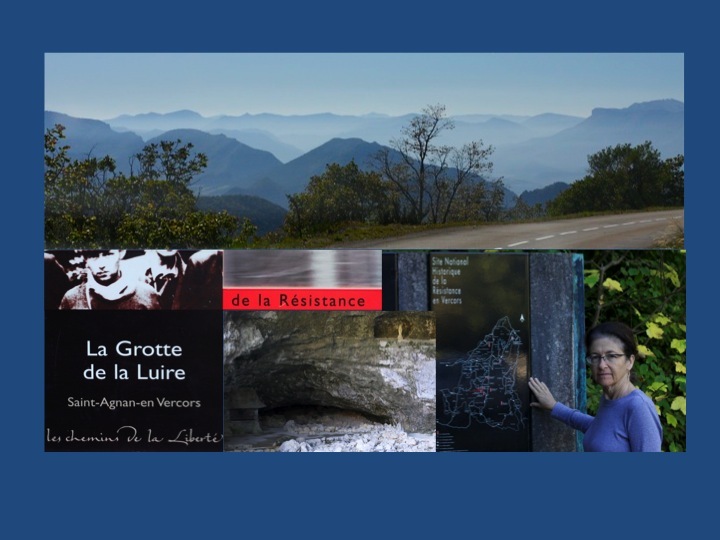 It was here that a brief roadside stop on a recent driving tour of this serene mountainous region near the Rhone River Valley led to my discovery of another element in the effort to defeat Naziism. From Wikipedia (http://en.wikipedia.org/wiki/French_Resistance): The French Resistance is the name used to denote the collection of French resistance movements that fought against the Nazi occupiers of France and against the collaborationist Vichy regime during World War II. Résistance cells were small groups of armed men and women who, in addition to their guerrilla warfare activities, were also publishers of underground newspapers, providers of first-hand intelligence information, and maintainers of escape networks that helped Allied soldiers and airmen trapped behind enemy lines. The men and women of the Résistance came from all economic levels and political leanings of French society, including emigres, conservative Roman Catholics, including priests; members of the Jewish community; and citizens from the ranks of liberals, anarchists, and communists. In the region of Saint-Agnan-en Vercors, a medical service was set up in February 1944. A hospital for 60 patients, and several medical aid stations for French Resistance and Allied combat forces were established in the region. In mid-July 1944, the Nazis launched a vast operation in the region. Nearly 100 wounded resistance fighters in the hospital at Saint Martin-en-Vercors had to be evacuated, and were taken to the Luire cave, deep in the forest outside of town. With the German attacks intensifying, the least wounded fled into the forest. On July 27, German soldiers arrived at the cave, and in spite of the Red Cross sign, started shooting the remaining hospital patients. Some patients were executed on site, others taken as prisoners to Grenoble. Doctors, nurses and other medical staff were deported to Ravensbruck. Thanks for the reminder and keep doing your good work.